Here are just some of the ways that we are empowering locals around the world. We believe that education and changing human behaviour are key to improving animal welfare and creating safer communities for animals and people. Within all of our international programmes, we spend time working with local communities to support them as well as delivering programmes for the street animals. Having formerly had a brutal and distressing job poisoning street dogs, the dog catching team in Kabul were frequently in receipt of abuse from local residents. 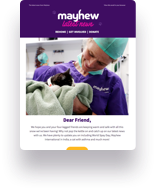 But since working with Mayhew, they now have more pride in their work and are welcomed into local communities. They are able to explain what they are doing and how it is helping Kabul residents. The community are even starting to approach the team with their own dogs for vaccination. When the dog catchers were poisoning the dogs, they felt wary of the dogs of Kabul. But now they are starting to understand these animals and treat them with the care and respect they deserve. A couple of dog catchers have now fallen in love with a street dog and have since adopted them as their own companion animal. In Ranchi, India, we fund an Education Officer for HOPE, who visits local communities and schools to educate children and adults on compassion towards animals, rabies prevention and the benefits of neutering. This helps to change their perceptions and improves the lives of both the animals and the humans in their towns and villages. This sponsored education programme has reached over 600,000 people spreading the word for animal welfare and compassion.